chakkara pongal is a variation of sweet pongal that is made with rock sugar or sugar candy. pick ½ cup rice and ¼ cup moong dal first to get rid of stones if any. then heat a small pan or a small kadai and add both the rice and moong lentils. on a low flame stirring often roast both the rice and moong lentils, till they become aromatic. you only need to roast till the moong lentils become aromatic. no need to brown them. now take them in another bowl and rinse both the roasted rice and moong dal a couple of times with water. drain well and then add them in a pressure cooker. also add 2.5 cups water and ¼ teaspoon ghee. pressure cook on medium flame for 12 to 14 minutes or for 8 to 10 whistles. meanwhile when the rice and dal is cooking, crush seeds of 4 green cardamoms + 1 clove in a mortar-pestle. if using cardamom powder alone, then you can add ½ teaspoon of it. the rock sugar needs to be crushed. i crushed them in a mortar-pestle. you can also place them in a dry kitchen napkin or a zip lock bag and crush with a rolling pin (belan). let the pressure settle down on its own in the cooker and then you remove the lid to check the doneness and consistency. lightly mash the cooked rice+dal. add ½ cup milk and keep the cooker on a stove top on a low flame. stir and mix the milk very well with the cooked rice+dal. you can skip milk if you want and add some water to get the right consistency. add crushed rock sugar. instead of rock sugar, you can even add ⅓ to ½ cup of regular sugar. mix very well and stirring continuously cook for 2 to 3 minutes. switch off the flame. cover the pressure cooker. if the pongal has a thick solid consistency then add more milk and mix again. the consistency of a pongal is like khichdi. heat 3 to 4 tablespoons ghee. you can add less ghee if you want. saute the cashews till they become light golden. you can even add raisins. then add the crushed cardamom + clove powder and a pinch of camphor. 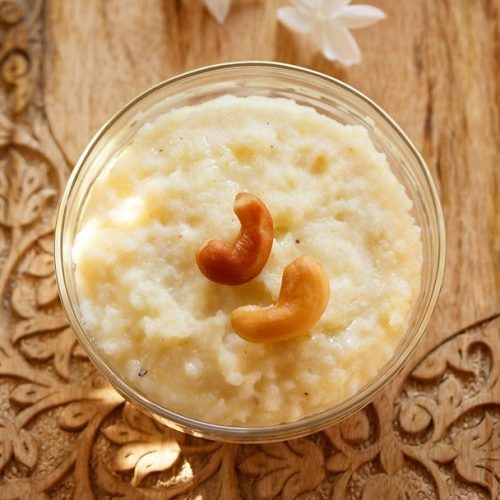 remove the pan from the stove top and add the fried cashews mixture to the sweet pongal. mix very well. offer chakkara pongal to the goddess or you can serve chakkara pongal hot or warm to your family members. sakkarai pongal thickens on cooling. so best is to serve it hot or warm. if you plan to serve later, then make the consistency slightly thin.